Here are just some of the core features that make our online Instant Gift Certificate & Gift Card Shopping Cart System one of the easiest to use and highly recommended by business owners nationwide. We provide you with a branded, ready to use, professional online system for selling and managing Instant Gift Certificates, Daily Deals, & Physical Gift Cards online which can be added to your website in minutes with a simple link or button. With the click of the mouse you can decide to offer Instant Gift Certificates that can be sent via email, text, or printed out. You can also offer your physical gift cards that you ship out when you get an order. 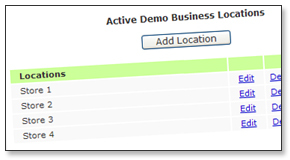 Easily enable both options and let your customers decide which option they prefer. By using Responsive Design we provide your customers with an optimal viewing & shopping experience across a wide range of devices. Your customers can purchase with ease from mobile phones, to tablets, to desktop computers. In addition to gifts by dollar amount, you can offer your specific packages or services to be purchased as a gift certificate. Easily add/edit packages or services with pricing, descriptions, and a sorting feature to prioritize your most popular packages first. Add or pause holiday specials in a snap. 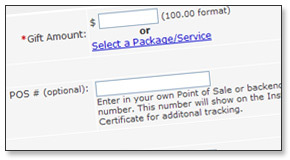 You can even disable the dollar amount option to offer packages only. 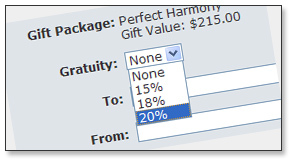 Enabling the optional gratuity feature is a great way to up-sell gift buyers at the time of purchase. Many gift givers like the option of giving an all inclusive gift that includes gratuity. You decide which gratuity percentages to make available (15%, 18%, 20%, or 25%). Great for boosting sales! Easy to use controls allow you to offer across the board discounts for all purchases or require a Promo Code. 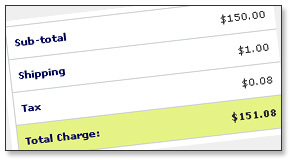 You can also trigger discounts based on a specific dollar amount. For example offer discounts like: Get $15 off when you order a $100 or more! or Get 10% off your order! This is a great way to introduce new customers to your business by offering a free gift certificate to the gift purchaser. You can offer a free gift certificate of any value to the purchaser for any order or only if the order total is over a specified dollar amount. 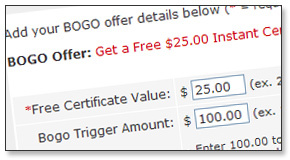 For example offer a BOGO promotion like: Get a Free $25 certificate for yourself when you buy $100 or more! Need to make an unsatisfied customer happy? Want to get a good customer to come back? 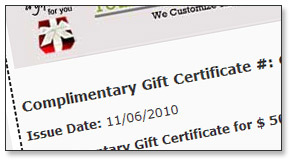 How about sending a customer or friend a birthday gift certificate? Easily email, text, or print a Complimentary Instant Gift Certificate for what ever occasion or reason...for as little as $0.30 per certificate. You can manage comp orders just like other orders in our system. Collect payment over the phone, in-store, or at an event and then use our system to easily email, text, or print an Instant Gift Certificate in just a few seconds. 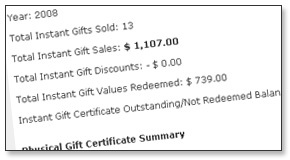 All for a fraction of the cost of mailing out physical gift certificates or gift cards. You can easily print out gift certificates for in-store orders too! 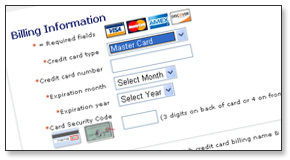 You can choose a shipping fee when selling physical gift cards or certificates. 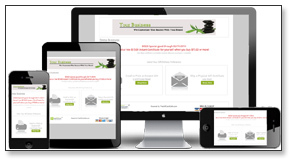 Our system will also handle any required sales tax based on your states's tax rate. This feature enables retailers with more than one physical location to track when, where, and by whom the instant gift certificates are redeemed. 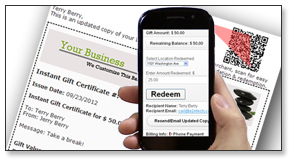 Easy to use tools to manage Instant Gift Certificate redemptions. 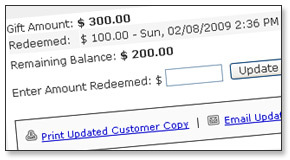 Track partial redemptions and quickly print out updated certificates with the remaining balance or email/text a copy to the customer with just a click of the mouse. We offer multiple ways to easily validate and redeem gift certificates via our merchant website, our free scanner app, and even standard text message.You pick what works best for your business. Your customers can purchase online with confidence because all transactions are protected with up to 256-bit Secure Sockets Layer encryption. We work with the top online payment processors in the industry so you can rest assure knowing that all payments are processed in real-time secure environment. Quickly export a comma delimited .CSV file with the purchaser or gift recipient email and mailing address. 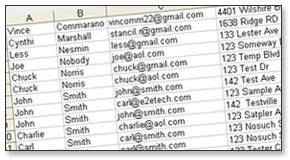 This feature is perfect for importing into another database, email systems, or third party applications. 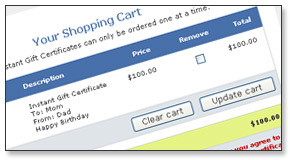 Once your application is approved, our design team will customize the shopping cart and instant gift certificate to match the design and brand of your website. 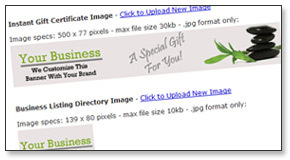 If you would like to change the images that appear on your shopping cart or instant gift certificate you may upload new images at any time. 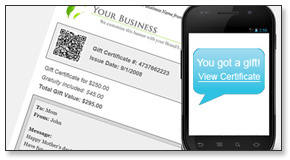 Boost sales and efficiency combining online scheduling & instant gift certificates. 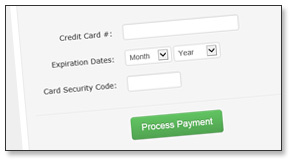 We make it easy to add online scheduling to your instant certificates via Schedulicity or Click4Time. 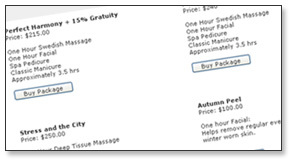 You can also promote gift certificate sales on your scheduling pages when you use either of these providers. Don't have online scheduling? Both Schedulicity & Click4Time offer FREE trials. Easily track which physical gift card orders you shipped out. Keep a history of ship dates and tracking numbers. Alerts remind you of orders that need to be shipped out. With the click of a button you can also send your customers professional shipping confirmation emails. If you use Stripe we offer a very convenient Integrated Virtual Terminal so that you can manually charge customer credit cards without logging in to another system. Perfect for taking payments over the phone or in person or when you don't have an in-house card terminal. Our per order fees do NOT apply to this extra feature. 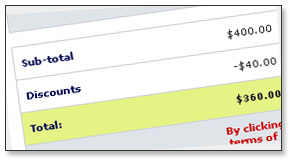 Our system offers easy to use sales reports that can be run monthly or by a specific date range. We also offer and annual summary reports for instant and physical gifts, shipping, sales tax, and redemption values which are useful for end of year accounting purposes.